500 were made. Now there's one less. It was bound to happen eventually and now it has. This Lamborghini Aventador SV Roadster has either suffered serious damage due to a front-end collision, or it could be declared totaled altogether. Here’s the annoying part: it’s for sale and it’s not cheap. 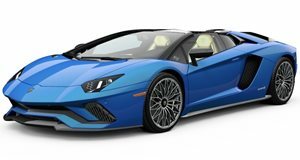 As of this writing, this Aventador SV has a current bid of $170,000 on the Copart website, and the reserve still hasn’t been met. Given its supposed retail value of $636,290, anything under $200k doesn’t sound terrible, but it is. Make no mistake about it, that damage won’t buff out. The problem, more than likely, is underneath that damaged sheetmetal. There’s a very good chance the Aventador’s carbon fiber monocoque structure has been damaged, and that’s anything but cheap to fix. In fact, it may not even be worth fixing at all. Obviously that’s a damn shame. This 2017 Aventador SV Roadster has (or had) just 73 miles on its odometer until the collision happen. No details of the accident are available, but it was clearly more than just a fender bender. Fortunately, the 6.5-liter naturally aspirated V12 engine with 740 hp appears to be unscathed, so it could be used for parts at the very least. But the moment you’re dealing with a structural issue, things are bound to get expensive (if not outright impossible to fix). Just 500 Aventador SV Roadsters were built, just to make this whole ordeal even worse. Now there's one less. Shame.